Birth Walter Thurley was born in 1872 in Great Hallingbury, Essex, EnglandBG. Death He died in 1951 at age ~79 in Bishop's Stortford, Hertfordshire, EnglandBG. Burial He was buried on 28 December 1951 at Bishop's Stortford Cemetery in Bishop's Stortford, Hertfordshire, EnglandBG. Birth Alice Thurley was born in 1873 in Bishop's Stortford, Hertfordshire, EnglandBG. Death She died in 1919 at age ~46 in Bishop's Stortford, Hertfordshire, EnglandBG. Burial She was buried on 15 July 1919 at Bishop's Stortford Cemetery in Bishop's Stortford, Hertfordshire, EnglandBG. Birth Annie Thurley was born in 1876. Marriage Lewis William Spriggs and she were married on 22 May 1900 at All Saints Church in Bishop's Stortford, Hertfordshire, EnglandBG. Marriage Lewis William Spriggs and Annie Thurley were married on 22 May 1900 at All Saints Church in Bishop's Stortford, Hertfordshire, EnglandBG. Birth Elizabeth Thurley was born in 1878. Marriage George Charles Lacke and she were married in October 1905 at All Saints Church in Bishop's Stortford, Hertfordshire, EnglandBG. Marriage George Charles Lacke and Elizabeth Thurley were married in October 1905 at All Saints Church in Bishop's Stortford, Hertfordshire, EnglandBG. Birth Emily Thurley was born in 1880. 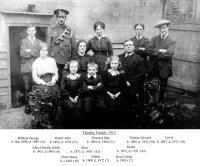 Member of household He appeared in the 1841 census in Great Hallingbury, Essex, EnglandBG. Father He appeared as the father of Aaron Arthur Thurley in the 1911 English Census in Bishop's Stortford, Hertfordshire, EnglandBG. Death She died in September 1893. Birth Thomas Edward Thurley was born on 24 September 1895 in Bishop's Stortford, Hertfordshire, EnglandBG. Death He died on 27 August 1952 at age 56 in Bishop's Stortford, Hertfordshire, EnglandBG. Birth Stella Whitehead Pluck was born on 23 September 1901. Chr He was christened on 30 October 1892 in Holy Trinity, Bishops-Stortford, Hertford, EnglandBG. Marriage Walter John Thurley and Susan May Lewyey were married on 22 September 1915 at The Church of St Saviour in Luton, Bedfordshire, EnglandBG. Birth Susan May Lewyey was born on 11 May 1894. Marriage Walter John Thurley and she were married on 22 September 1915 at The Church of St Saviour in Luton, Bedfordshire, EnglandBG. Death She died in 1967 at age ~73 at Q.E.2 Hospital in Welwyn Garden, Herfordshire, EnglandBG. 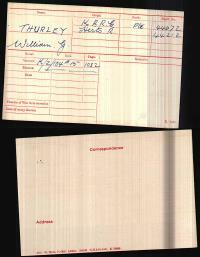 [MIL] Military card for William George Thurley. Marriage He and Edith May Field were married on 24 April 1926 at ST GILES CHURCH in Great Hallingbury, Essex, EnglandBG. Death He died in 1985 at age ~86 in Bishop's Stortford, Hertfordshire, EnglandBG. Burial He was buried in 1985 at Bishop's Stortford Cemetery in Bishop's Stortford, Hertfordshire, EnglandBG. Birth Edith May Field was born in 1905. Marriage William George Thurley and she were married on 24 April 1926 at ST GILES CHURCH in Great Hallingbury, Essex, EnglandBG. Death She died in 1981 at age ~76 in Bishop's Stortford, Hertfordshire, EnglandBG. Burial She was buried in 1981 at Bishop's Stortford Cemetery in Bishop's Stortford, Hertfordshire, EnglandBG. Birth Rose Lillian Thurley was born on 22 September 1903. 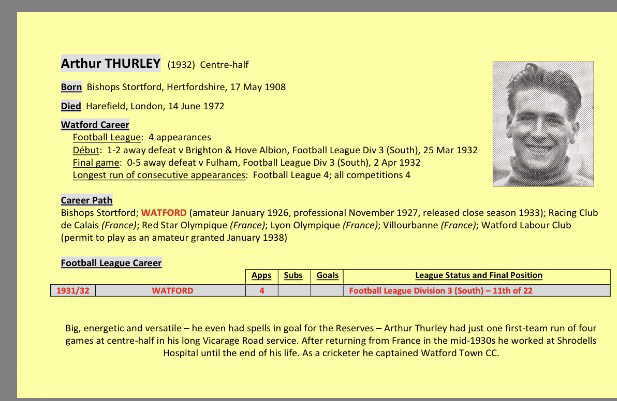 [PE] Football details for Arthur Thurley (alias Felix). 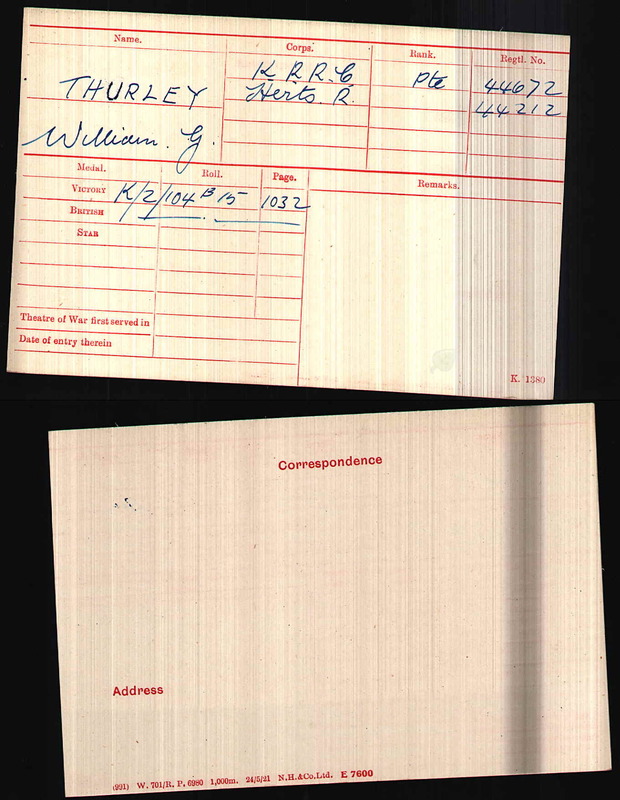 Marriage Arthur Thurley and Annie Ballam were married in 1929 at Registry Office in Watford, Herfordshire, EnglandBG. Birth Annie Ballam was born on 18 December 1911 in Watford, Herfordshire, EnglandBG. Marriage Arthur Thurley and she were married in 1929 at Registry Office in Watford, Herfordshire, EnglandBG. Death She died on 18 April 1999 at age 87 at General Hospital Watford in Watford, Herfordshire, EnglandBG.